К-т вложки за алтернатор - 6 части - ZIMBER-TOOLS. ВИДЕО. Allows alternator shaft to be captivated while the caster adaptation is removed.Applications: Audi, BMW, Citroen, Ford, Merrcedes, Opel, Peugeot, Porsche, Renault, Vauxhall, Skoda. 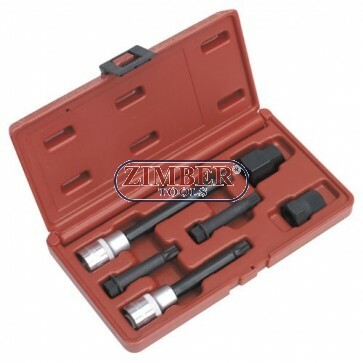 К-т вложки за алтернатор - 6 части - ZIMBER-TOOLS.